LITTLE MAN, WHITTLE NOW? 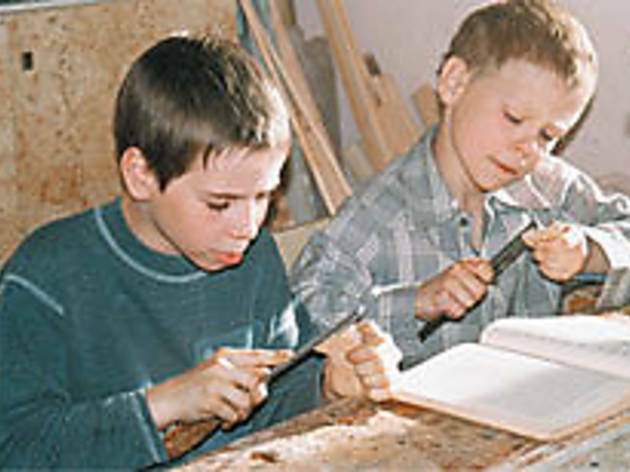 Spiridonov, right, conducts his own woodworking class. You can’t be blamed for seeing The Italian’s underage lead—a blond Euro-moppet with a face that could grace a Campbell’s soup can—and thinking that you were in for cherub-cinema sugar shock. But Kolya this isn’t; Andrei Kravchuk hews closer to the spirit of Germany Year Zero and Shoeshine, two movies that wrench your heart yet never sink under the weight of their own street-urchin tragedies. At the Dickensian orphanage that he calls home, Vanya (Spiridonov) hits the jackpot: An Italian couple wants to adopt him. Then a friend’s birth mother shows up, and Vanya’s mind starts racing:What if my own mom came looking for me? he thinks. After sneaking a peek at his file, Vanya hits the road. The house madam (Kuznetsova), who doesn’t like losing commissions, is hot on the boy’s trail.